Madakaripura Waterfall East Java Indonesia provides a natural landscape of a very beautiful waterfall. Waterfalls Madakaripura waterfalls one of the waterfalls located in the area of national park bromo tengger semeru. When you first come to this place, you will be amazed after seeing the waterfall that flows between two walls of rock cliffs. Many of the beauty that you can explore in this waterfall area. Just like a cave located just below the main waterfall. When you want to find this cave, you have to pass a pool of water that has an area of approximately 25 square meters. While the depth of the pool itself is about 7 m and the mini kola has a very heavy stream of water. This waterfall has a unique architecture, you will be very impressed with the beauty of this waterfall. You are astonished at the vocabulary created by the Creator. Madakaripura Waterfall East Java Indonesia, for those of you who come from east java must be familiar with this word, and you will be directly fixed on the big hero sosol able to unite the archipelago under a Majapahit palm sugar flag namely Maha Patih Gajah Mada. If we trace deeper, Madakaripura waterfall is closely related to the long history of the Majapahit kingdom. Patih Gajah Mada and Hayam Wuruk managed to unite the archipelago. Patih Gajah Mada own excellent skill in the field of strategy, diplomacy, and even war. That is why Patih Gajah Mada is able to be trusted by the kings of Nusantara. The contents of the oath are: “Sira Ggajah Mada papatih amungkubumi tan ayun amukti palapa, sira Gajah Mada: Seagrass huwus lost nusantara ingsun amukti palapa, seagrass lost ring Seram, Tanjungpura, ring Haru, ring Pahang, Dompu, ring Bali, Sunda, Palembang , Tumasik, samana ingsun amukti palapa. Madakaripura own attraction has a million mysteries, where this place has a mystical aura that you can feel when it entered the area of this waterfall. For those who are not accustomed may make the hair goose bumps. But do not be afraid, and smaller to undo the intention to come to this attraction. If you come with good intentions, nothing will happen. According to the belief circulating in the midst of the surrounding community. You are advised to leave this place before 14.00. Because it is believed there will be rain that can affect the sudden water debit around the flow of waterfalls. This is considered quite dangerous, and allows you the suit to leave this place. Beyond beliefs trusted by society. This tourist attraction menonjilkan pull attraction. No wonder if some travel agents who set up Bromo as a destination, will usually insert Madakaripura as a tourist destination tourist destination. If you want to explore East Java, Madakaripura waterfall should be your tourist destination. Madakaripura can be reached from Malang or Probolinggo. 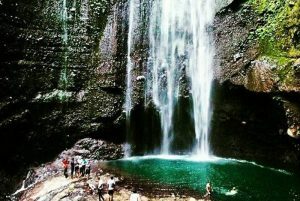 No need to worry, to get to this waterfall you can easily, just by bus ride to Tomang and angkot you can go directly to the location. Throughout the journey from Tomang to Madakaripura you will be amazed by the beautiful scenery and fascinating, but you feel the discomfort when traveling because of unfriendly road conditions. Accessibility to the Madakaripura waterfall is about 5 km from the highway to Bromo or about 45 minutes from the tourist location of Mount Bromo to Probolinggo (to the north). However if you are from downtown Probolinggo district about 30 km. 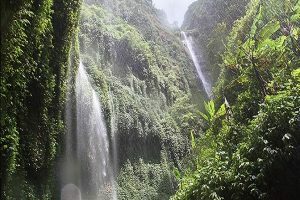 Location of this waterfall can be reached by private vehicle or rental car, with price range Rp 150.000, – PP + driver (this price can change at any time). The condition of the road that you will then turn twisted and has been paved but a little narrow. Arriving at the gate adan enter the parking area, you are required to walk approximately 1 km through the path. To get to the location of the waterfall you should use the services of a guide, because the road to the waterfall has a fairly heavy field. In addition, in this location is often flood and landslide. For a guide fee about Rp 50.000, – for one way. When it must and hunger struck, you do not have to worry about approaching the location of waterfalls will be found bebrapa stalls selling drinks and food. Warung: You do not have to worry, in this waterfall area there are quite a lot of stalls that menjajahkan various kinds of eating and drink. So if you forget or run out of food supplies and drink do not need to worry, you can still find easily in this tourist location with quite affordable prices. Mosque: For you who are Muslim, do not worry worship becomes the main point for you. While enjoying the beauty of Nature created by the Creator, you can still perform your duties in this place. Bathroom: There are some bathroom facilities that have been provided by the manager, you can use it. But you must keep cleanliness for the bathroom that has been provided this can be maintained properly. Parking lot: As with other tourist attractions, this tourist site provides adequate parking. But you have to be careful that you do not feel anxious when your vehicle is parked. Keep your vehicle security by double locking. Lodging: This attraction is quite in the interest, so from that many business people in the field of hospitality quite interested to establish hotels and inns near this tourist area. If you do not want to get wet, forget to bring an umbrella or raincoat. But do not worry if you do not carry or forget to bring, you can rent in the tourist area. Bring a change of clothes, to anticipate the clothes you wear wet already. Do not hesitate to use the services of the guide, because they are more familiar with the terrain that is safe for you to go through. And most of all, do not forget to pray and clean the day of any intentions. 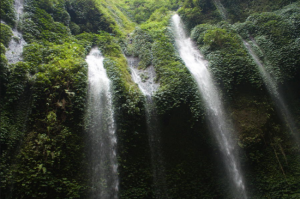 If you are first visiting the waterfall Madakaripura be careful of the elements that use the location. For example, if you use a motorcycle and parked it in a stall, then after you come back you will be asked for money on the grounds they have washed your bike, but in fact your motorcycle sepedah only watered with water only. How? Interested to come to this tourist place? Let’s invite family, friends, girlfriend or even your best friends to this place. Let’s explore the natural beauty of Indonesia.